We manufacture, sell and rent outdoor onsite inflatable advertising products. Based in Tampa Bay, Florida we specialize in the manufacturing and rental of giant advertising balloons and custom shaped inflatables, custom and stock flags, banners, helium blimps, cloudbusters, air dancers and more. We provide our outdoor promotional products throughout Florida, the United States and the world! We can coordinate promotions for your business throughout the US and Canada through our network of certified, insured, and professional installers. No matter where you are, Skyline Promotions will help you get the attention and traffic to your business. "Inflating your business is our business … Selling and Renting, spectacular giant advertising balloons Since 1988." Air dancers are great for grand openings; holiday sales, special sales events, and on location branding. They are economically priced and are guaranteed to get you noticed! Inflatable product replicas are a great way to promote your brand. They are a unique way to stand out at trade shows, announce a grand opening, or a new product launch. You won’t go wrong with these larger than life inflatable characters. These giant balloons are definite attention getters! Consider these for Grand Openings, large sales events, and car dealerships. These affordable attention getters are especially useful in areas with limited space or lack of electricity…making them among the most versatile outdoor promotional products. 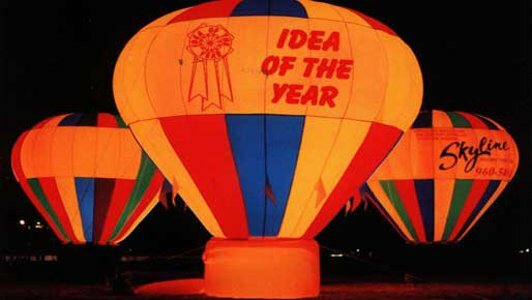 Giant hot air shaped balloons are the undoubtedly the most popular advertising inflatables. They are iconic outdoor advertising and are immediately associated with a big special event. Unlike our helium filled cloudbusters which cannot be reused, our PVC blimps and spheres have the advantage of longer flying life, larger size, and capability of carry a message. Looking for an effective way to bring attention to your restaurant, concession trailer or food truck, we have the solution for you! Easy to store, easy to set up, guaranteed to get you noticed! Affordable, practical, and versatile…our giant latex helium filled balloons- also known as cloudbusters float up to 100 feet above your location drawing attention for miles around. Need to get your business or event noticed? Look no further! 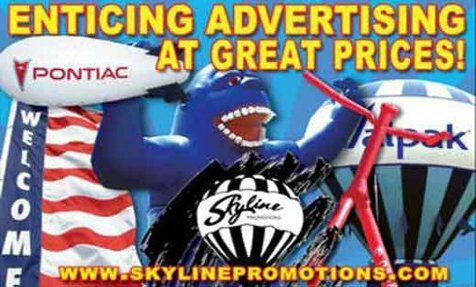 Skyline Promotions is your one stop source for spectacular inflatable advertising promotions. Our giant advertising balloons and inflatables are proven to grab attention, drive traffic to your location and get the message out about your event or promotion. At Skyline promotions we pride ourselves on providing quality and reliable products and services at affordable prices. We carry inflatables of all types and sizes. We have a large inventory of giant advertising balloons that are guaranteed to grab attention and help your event stand out from the competition. If we do not carry an advertising balloon that fits your promotional vision we can custom make one that does.